Moreover, the past 7 handled flags were deemed helpful. I have 19 declined flags since several days and I am sure about this time and amount (no mistakes). The first handled flag of the past 10 days and also 20 days is a declined flag. I could continue to review after I got two helpful flag after it. 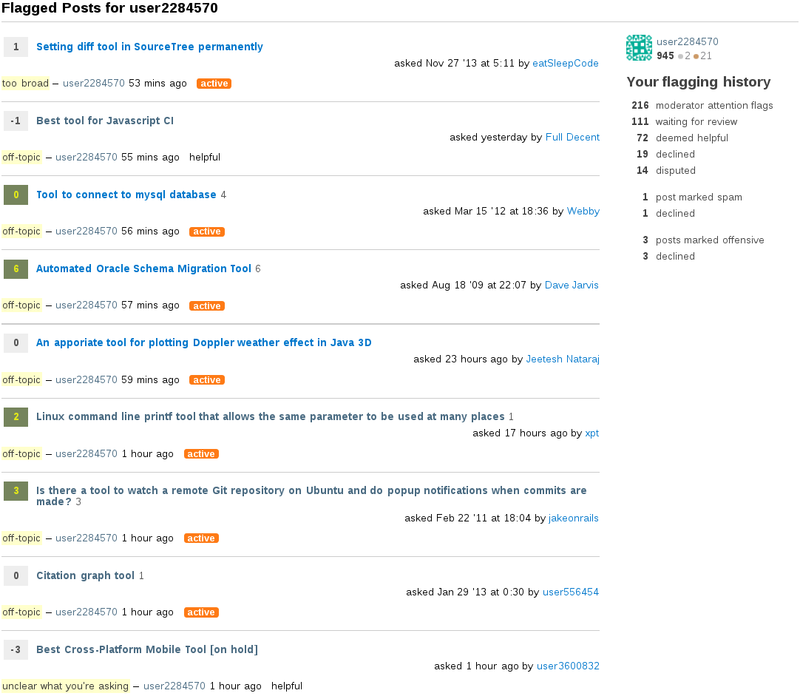 Update : The post linked as duplicate don't talk of a bug. It tell he has been flag-banned after getting a declined flag which can look normal. I already knew and used this link my comments, and I'm not asking how this does work (please read this question : I'm talking about the conditions of such bans). What append is that I have been banned after getting an helpful flag, and it didn't represented 25% of declined flags in the past 7 days. Please vote to reopen! Referencing Shog's answer explaining the new flag ban, you are judged only on flags handled within the last 7 days, and you are banned when 25% of those flags are declined. In general, the flag ban deals with 3 different variables, any of which will change the status of the ban. Total number of handled flags. Handled is the operative word as the ban is based on when flags were handled and not when the flags were actually raised. Total number of flags marked as declined. Time - specifically when flags were handled as helpful and declined flags can age away, which will impact both (1) and (2) above. So time is as much of an enemy here as declined flags. For example, your flag history has 5 declined flags and 16 helpful flags in the last 7 days. But if 4 of those "helpful" flags were 7 days ago, they will no longer be tracked. If you only get 2 more flags handled to "replace" the 4 that no longer count, you'll be below the 25% threshold and will be subject to the ban. By tomorrow, 4 helpful flags no longer count because they are >7 days ago, and you get only 2 new helpful flags. And this can change again as more flags are handled, or as more helpful and declined flags age away. Now in your specific case, with the info you have provided, it is not immediately clear why you were banned. Unfortunately, not even you can see when flags where handled in your flag summary, you can only see when you raised the flag and when the post you flagged was published, so it is impossible to determine exactly what flags are contributing to your flag ban. You might be interested in Can we make new flag responses more visible? and Overview on my recent flagging activity?, as both would help provide more insight into exactly what flags are being considered in the ban calculation. However, so if your record keeping is accurate, it is not entirely clear why you have been banned, but as mentioned in the first half of this answer, it is entirely possible to have multiple helpful flags and still get banned based on aging of other flags. Not the answer you're looking for? 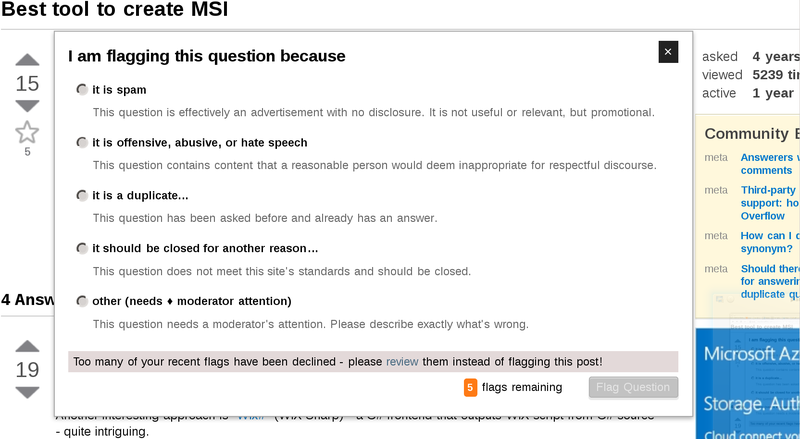 Browse other questions tagged bug flags flag-ban . Are there something like “flag banned” for many declined flags? What detrimental effect do declined flags have? Why was I banned from flagging? How can I improve my flagging behavior as long I'm banned from flagging? How can I review a flag? Why am I banned after a single helpful flag after flag ban? Banned from Flagging - How to avoid?